Post-War Subic Bay MB The photo on this page were donated by Claude Darden Here is a shot of a family friend from Subic Bay Philippines. Sam Hallmark, Civilian, was in charge of the Navy supply depot. He served in the army during the war, out of Subic. When the war ended, he stayed in the Philippines and worked for the navy. He owned a small plantation near subic, and as far as I know is still there, if not dead by now. This photo was taken by my Step Father, Bill Lemke, in 1954. They were close friends. Notice the fender treatments and doors! Really personalized! And check out that stylish top, civilian tires, one wiper, color of jeep. What a great looking “retired” jeep. 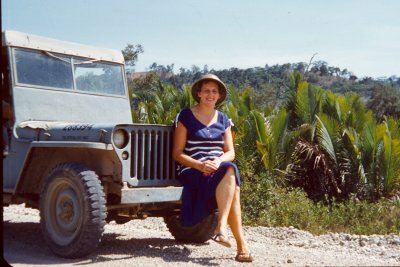 Here’s one of Claude’s mother sitting on the front of their jeep. They were out for a ride. Circa, 1954, Subic Bay, PI. There was Canvas over the cowling, he doesn’t know why. 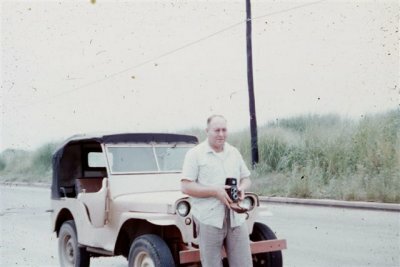 He recalls really enjoy riding around in that jeep! Notice the windshield front and the raised roof. 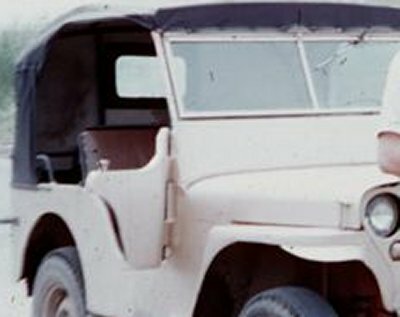 Claude says it was one of the few jeeps on base with those differences. He thought it looked funny. In this closeup, notice that the jeep has an extra hold down catch. The canvas covering could be for any purpose. My thought was to deflect rain water from entering through the hood. Also, notice the “For Official Use Only” on the side of the hood under the number. Thanks Claude! Send more!